OSF for Drupal is a set of Drupal modules used to create Drupal websites using the Open Semantic Framework. This user's manual will walk you through the necessary steps to properly configure an OSF instance using Drupal instance, explaining available features as appropriate. 14.1 How does it works? 14.2 When is it helpful to run this pre-caching mechanism? The OSF for Drupal Configuration manual will drives you all the initial OSF for Drupal configuration steps that you have to do in order to connect it to an operational OSF Web Services instance. It assumes that you just finished to install OSF for Drupal using the OSF Installer and that the OSF instance is running on the same instance (but it can be running from anywhere, as long as the Drupal server as access to it). To register a new OSF Web Services endpoint, you have to click on the top Configuration menu item. Note that this page is the main Drupal page where you can configure all the enabled modules. Then, you have to click the Configure OSF for Drupal modules. Now you get to the main OSF for Drupal configuration page. All the configurations for all the OSF modules are accessible from that page. What you want to make sure is that the DATASET & NETWORKS tab is selected. Then you have to click on the OSF API Endpoints link to get to the page where you will register your new endpoint. Before importing a custom dataset into OSF, you should import all the ontologies that are used to describe the content of these datasets. To import a new ontology, click the top Ontologies menu item. You will get to the OSF Ontology module page. From there, you can import a new ontology by clicking the Import button. A new importation section will appear at the bottom of the ontologies list. Click the Browse button, select the ontology file to import and click the Import Ontology button. Now that we have successfully registered a OSF instance, the next step is to import a new dataset to test this new installation. What you have to do is to click the + Import Dataset link on the DATASETS & NETWORKS tab. At this point, the dataset got created into the OSF instance. Then all the content of the dataset file you imported as been indexed in that newly created dataset. One of the last thing you may want to do is to properly setup the permissions of the dataset you just imported. You can read more about the dataset permissions on the Manage Permissions page that explains everything related to these dataset permissions. If you want to make the content of that new dataset readable by everybody, then you first have to get to the page where you can setup these permissions. On the page that list all the datasets, click the Edit link. Then click the Permissions link. Then you will get to the page where you can change the permissions of the dataset. Since we want to make the dataset readable to everybody, then we will make sure that all the checkboxes of the Read line are checked. What we are specifying here is that we want all these roles (which includes anonymous users) to be able to read content from that dataset. Finally you have to scroll down that permissions page, and click the Save button to save the newly configured permissions. Finally, let's browse and search for the records we just imported. You can access an administrative browse & search tool by clicking on the top Resources menu item. Once you click on that menu item, you will get redirected to the page below. From that page, you can browse the entire content of the datasets that have been exposed to Drupal. You can also search & filter by datasets and types. Additionally, you will be able to perform different operations such as editing, deleting and viewing these records. If you want to know how this tool work, you can refer you to the Using OSF Entities and Resource Types page. Finally you should read the OSF for Drupal User Manual to be aware of all the features proposed by the complete set of modules. A dataset is a set of data records (or a set of entities in Drupal parlance) that define access permissions to the data it indexes. Every time you create, read, update or delete an entity, you are creating it, reading it, updating it or deleting it from a dataset where you have the CRUD permissions to perform these actions. This section shows you how you can manage the datasets on Drupal. This section shows you how these two methods can be used on Drupal. To create a new empty dataset, you have to click the + Create New Dataset link from the Dataset & Networks tab. Then once you are done, click the Save button to create the new dataset. Once you created this new empty dataset, it will be created in the OSF Web Services endpoint you selected. It will also be automatically exposed in Drupal. However, it will be completely empty. The next step would probably be to start creating new entities into this dataset. When you register a new OSF Web Service endpoint to the Drupal instance, you should see appearing a list of new datasets in the list of datasets accessible to that Drupal instance. However, it is not because you registered the new endpoint that all the datasets become automatically usable by Drupal. What you have to do once you registered a new endpoint, is to expose the datasets to Drupal. 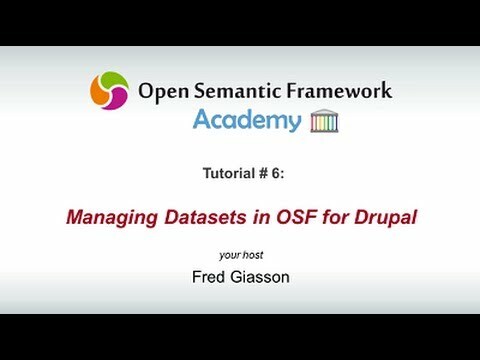 Once a dataset is exposed to Drupal, it then become available to all the OSF for Drupal modules. To expose a dataset to Drupal, you first have to click on the top Configuration menu item. Then, you have to click the Configure OSF for Drupal modules. If a dataset is available, you will see "Available:" in front of its title. Then, you have some more information such as its URI, the type which is Disabled and you also know from which Endpoint this dataset is coming from. If you want to expose that dataset, you have to click on the Add link. Once you are done, you simply have to click the Save button to expose the dataset to Drupal. This section only focus on changing the permissions of a dataset. You can read more about the dataset permissions on the Manage Permissions page that explains everything related to these dataset permissions. Now to access the page to change the permissions of that dataset, you have to click the down arrow at the left of the Edit link. Then you have to click on the Permissions link. To change the permissions of the dataset, you have to check the checkboxes to enable the CRUD permissions for different Drupal Roles. The dataset permissions have to do with accessing and managing the data. The modules permissions have to be with accessing the OSF for Drupal tool into the web portal. In OSF, all the datasets are governed by a series of access permissions. What these access permissions specify are the CRUD permissions for every group of users that exists in the system. In OSF for Drupal, everything dataset does have Create, Read, Update and Delete permissions attached to all defined Drupal Roles. This means that all the users that have a specific role will inherit the CRUD permissions associated to that role. By example, if the History Images Iowa City does define full CRUD permissions to the Contributor role, then it means that all the users that have this role will have full CRUD permissions on that History Images Iowa City dataset. To change the permissions of a dataset, you have to click the Datasets top menu item. Then select the dataset for which you want to change the permissions and click the down arrow at the right of the Edit link. Then click on the Permissions link. Then you will get redirected to the section of the Drupal Permissions page where you will be able to configure the dataset permissions. Every dataset that has been registered to a Drupal instance will appears in the global Drupal Permissions page. Each of the dataset will be highlighted using a different color. It is very important to understand the layout of that page to be able to properly configure the permissions of a dataset. In the Permission column, we have each colored dataset outlined. We have their name, the endpoint where they are indexed, and the the access permissions (one per row): Create, Read, Update and Delete. Let's take a few examples to understand how the permissions should be configured. What will be required is that the Read row be checked for the Anonymous user column. Then you have to make sure that the Create, Update and Delete checkboxes are unchecked. What will be required is that you make sure that the Read row is unchecked for that dataset. What will be required is that the Create, Read and Update rows be checked for the Contributor column. Then you have to make sure that the Delete checkboxe is unchecked. These are all the Drupal modules permissions that are related to OSF for Drupal. In this section, we are describing the impact of each of these configurable permission. Specifies if the role can access the OSF for Drupal proxy. A search profile is a predefined search query where its search results are displayed in a block positioned on some Drupal pages. These search profiles are normally used to display list of information that match a search query. Search profiles are also to some extend aware of their context. For example, if the main topic of a page is about cancer and if we have a search profile that displays list of events, then when the search profile is used in the context of that page about cancer, then cancer related events should be displayed. That is one of the core purpose of the search profiles. To create a search profile, we have to generate the search query that will be used by it. As we saw in the previous sections, the query is created using the OSF Query Builder. Then you have to save it using that same Query Builder. Once the search profile is saved, it will appear in the list of available search profiles as we will discover in the section below. The see the list of all available search profile, you have to click the top menu item Configuration. Then you have the click the Search Profiles link under the Search and Metadata section. The Search Profiles page does list all the search profiles you saved using the OSF Query Builder. From that page, you can create new search profiles using the + Create New Search Profile link. This link will redirect you to the OSF Query Builder page. If you click the Edit link of one of the search profile, you will be be able to edit some information about that search profile. This is the JSON object of the Search query that as been generated by the Query Builder. You can change that query directly in that box. But take care of what you are doing since it could break the search query. Now that we have created a search profile, the last step is to add this search profile to a block, and then to position that block on the Drupal portal. To add a search profile as a block, you have to click the Structure top menu item. Then you have to click the Blocks link. Then you have to click the + Add search profile. This will will redirect you to the page that you will use to configure how the search profile will be embeded in a new block. Will check if topics are related to the page where the block appears. Topics can be added using the hook_osf_searchprofiles_page_topics hook. Once you are done configuring the new search profile block, you can click the Save block button to save that new search profile block. Then you will be redirected to the list of available blocks of the portal. You can position the new block using the positioning drop-down box. Once you positioned the block, it will re-appear in the section you selected. At that point, you have to make sure to save that new positioning by clicking the Save blocks button. Creating a template for a ResourceType entity is not different than creating a template for any other type of Drupal Entities. The same API, methodologies and concepts can be used. This is a StructuredDynamics\osf\framework\Resource class instance that can be used to manipulate the entity's content. The Resource class should be the first choice of the themers since it has been specifically created to make the templates easier to create, maintain and read. This is a StructuredDynamics\osf\framework\Subject class instance that can be used to manipulate the entity's content. The Subject class does have a complete API that is available to the developer to help them manipulating the content of an entity. Here is a simple template that uses the $entity variable to display information about an entity. Here is a simple template that uses the $subject variable to display information about an entity. In this section, we cover the relevant API functions that can be used on a $subject variable. Get all the alternative labels of this subject. Returns an array of alternative labels. Returns an empty array is there is none. Get the URI of all the data properties that describes this subject. Returns an array of all the URI of the datatype properties that describe this subject. Get the values of a data property. Return an array of values for the input property URI. "type" => "type of the value"
Returns the description. Returns an empty string if there is none. Returns an array of all the URI of the object properties that describe this subject. Get the values of an object property. Can force a preferred to be returned. If the $force parameter is TRUE (default) then in the worsecase, getPrefLabel() will return the subject's URI fragment as the pref label if nothing else is defined for it. Returns the preferred label. Returns an empty string if there is none and if $force is FALSE. Returns the preferred URL. Returns an empty string if there is none. Get the array description of the Subject object. Get all the types of this subject. Returns an array of types URIs. Returns an empty array if there is none. In OSF for Drupal, everything that are manipulated are [resource] entities. Any entity has at least one or multiple types. These types are defined, and hierarchized in an ontology. It is these types that will determine which template will be used by Drupal to theme and display one of these entities. Now let's assume that a user is accessing an entity page of type foaf:Organization. If we check the classes hierarchy that is currently present in OSF, and if we check the templates that are currently available in Drupal and we if follow the templates selection heuristic defined above, we will see that the resource_type.tpl.php default generic template will be used because there exists no template for that type, and none of its parent classes does have one neither except owl:Thing. Now let's assume that a user is accessing an entity page of type foaf:Person. If we check the classes hierarchy that is currently present in OSF, and if we check the templates that are currently available in Drupal and we if follow the templates selection heuristic defined above, we will see that the resource_type__foaf_person.tpl.php template will be used because there exists a template for the foaf:Person class. Now let's assume that a user is accessing an entity page of type foaf:PersonByOccupationArtist. If we check the classes hierarchy that is currently present in OSF, and if we check the templates that are currently available in Drupal and we if follow the templates selection heuristic defined above, we will see that the resource_type__foaf_person.tpl.php template will be used because there exists a template for a parent class: foaf:Person. Note: Every time you add or remove a template, you have to clear the Drupal cache in order to take the modifications into account. Note 2: You *have to make sure* that the base URI of the class you are templating does have a prefix in the list of namespaces/prefixes. Theming search results that will appears in Search Profiles is exactly the same as theming search results that will appear in normal search results pages. The same templates are used whatever if they are displayed in a search profile or not. To configure OSF Ontology, you have to do is to click on the top Configuration menu item. Then, you have to click the Configure OSF for Drupal modules. Then click the the ONTOLOGY tab. This option force the read mode of the ontology management tool. All users, including system administrator will only be able to read and export ontologies from this user interface. All the administrative tasks, such as creating, deleting, saving, etc. ontologies will be done using the Ontologies Management Tool command line utility. This will enable the reasoner by default when a OSF Ontology view page is being opened by a user. This will enable the search feature embedded into the OSF Ontology module. If this option is unchecked, all the search options will be disabled in the module. This will enable the export feature embedded into the OSF Ontology module. If this option is unchecked, the export button won't be displayed to the users. This is the path of the folder where ontologies files get saved on the server. This is the path of the folder where ontologies cache files get saved on the server. This is used to to save the cache of the ontologies. These caches are used by OSF for Drupal and OSF. This is the path of the folder where ironXML Schemas cache files get saved on the server. This is used to to save the cache of the ontologies in ironXML schemas. These caches are mainly used by the OSF widgets. This folder should be accessible on the web so that any OSF widget has access to them. Note about Ontologies Files: The ontologies files and paths settings are used in a OSF (Open Semantic Framework) single server instance. These paths tells the OSF Ontology module where to save, load ontologies and where to generate sub-structures. These need to be properly configured when you want to use OSF Ontology to administer ontologies on your server. To access the OSF Ontology tool, click the top Ontologies menu item. All of these functions are not available to all users, except viewing available ontologies (if settings allow so). Most options require being at least at a 'curator' or 'admin' level. Create, modify, annotate or delete actions on ontologies are the most privileged functions within the system. As a result, most all ontology actions are accessed (if permissions exist) through the broad Ontology tool from the main tools listing, or from privileged positions on a few other screens. Administrative Ontologies - these are internal ontologies that guide and govern the use of widgets, permissions, components and other administrative functions of your site. Most site administrators will have little or no reason to make any changes to ontologies in this category. The currently active ontology is picked by selecting one of the radio buttons, in which case the selection is highlighted (orange/brown in this example). The active ontology is what is subject to the various button options to the right of the display. Via this choice, you may change the title, description or ontology type (for the listing on the main page). If you need to make more nuanced annotations (such as version number, etc. ), you will need to use a third-party ontology editor such as Protégé. From the main screen you may also search the Active or All ontologies (described further below). The main screen also offers various user or admin functions, as shown by the button options at the right of the display. Each of these options is described in detail below. Finally, note that your interaction with the OSF Ontology application is recounted via the "breadcrumbs" listing at the upper left of the application. The View/Annotate option under the right User/Admin panel is the key one in the application. As such, we will give this option more attention than the others. Later sections describe the various section in the right-hand panels in more detail. Searching can take place on the currently active ontology or all loaded (available) ontologies. Note that selection was made above via the radiobutton under the search box. The desired search results then automatically expand the ontology tree. This is really helpful for longer ontologies (the example one shown has about 3000 concepts and about 6000 axioms) and means quicker initial tree loading. Once completed, the (multiple) occurrences of the search item are shown in highlight throughout the tree. Note this search is not necessarily restricted to the actual node label. Alternative labels and descriptions may also be used to find the search results. This greatly expands the findability of the search function. This functionality is identical to the standard advanced search functionality. See that document for detailed guidance on its filtered search and auto-completion aspects. This functionality and feedback means that only allowable assignments can be dropped into a new structural definition. The tooltip shows the full URI path (unique identifier) of the selected item. These operations all tend to apply to the Classes, Properties and Individuals tabs. Please refer to this section for general use tips. Note: as you work with ANY tab or individual selection from the left-hand list for that tab, you MUST Save you changes before proceeding to another item or tab. If you move away from the current view, your modifications will be lost if you have not Saved. Each panel has an expand and collapse arrow shown at the upper right of its panel. These causes the panel's individual entries to either be exposed or hidden. Further, some of the fields feature auto-completion, which means there is a URI designation for the field entry, drawn from existing objects in the various ontologies. If applicable, the entry field will include either this spinning symbol or an alternate designator . When encountered, you trigger the auto-completion list by entering a minimum of three characters. Then, you must pick one of the entries from the dropdown list. It will then populate the entry field. In working with each panel, note that each entry also has the search and auto-complete features earlier noted. Drag-and-drop is also contextual into these panels or not, depending on the nature of the item selected in the left-hand panel (tree). With this basic overview of the operation and layout of OSF Ontology, we are now ready to focus on the items in the right-hand panel. Again, we are using the main View option. Each of these is discussed in turn. Entries are simply provided by entering values into the text fields and then Saving. The structural relationships are the means to set parent and child relations between concepts, as well as to instruct disjoint or equivalent class relations. The Structural Relationships panel is the key one for setting the interconnections within the graph structure at the heart of the governing ontology. As with the prior panels, new instance may be added or discarded ones deleted. Individual instances and their characteristics may also be updated or changes. This option has the specific behavior of allowing one or more properties (characteristics) to be asserted for a given a class (concept). The relationship of widgets to information items is a deserving topic in its own right. For more information about this topic, see the OSF widgets category, especially regarding the SCO Ontology. Note the Properties tab has the same basic layout and operations as the Classes tab, including similar right-hand panels such as annotations or structure. A key difference is the ability to set domains for properties. When set, this constrains the property to be only applicable to a certain class of nodes as the specifying subject. Individuals are the instance members of classes. Note the Individuals tab has the same basic layout and operations as the Classes tab, including similar right-hand panels such as annotations or structure. Key uses of this tab are to provide the data and display definitions for specific individuals and indicators. For more information about some of these settings, see the OSF widgets category, especially regarding the SCO Ontology. We are now ready to look at the non-View options in OSF Ontology. This file can now be used in an external ontology editor (such as Protégé) or edited directly with a text editor. After those changes are made, generally useful when bulk changes are desired, the updated file can be imported back into the system; see Import below. The URL (such as http://purl.org/ontology/myont#) becomes the base URI for your new ontology. Note: there is a file on your standard OSF install -- /data/ontologies/files/mew.owl -- that contains the starting basis for this initial ontology framework. Should you wish to create ontologies with a different starting structure, modify this file and save it under the same name. It will then become the starting basis for new created ontologies. Once created, this new ontology also now appears on your available local ontologies when first invoking the OSF Ontology application. You are advised to Save prior to all export or Generate All options. The Delete option removes the currently active ontology from your local instance AND from your server hosting the instance. Therefore, use with caution. Note: as an alternative to Delete you may use the Reload All option to wipe out any local, unsaved options and to restore the starting versions located on your server instance. See below. The Delete option removes the server version. This is the most drastic option since removal means no local instances may again access or use that ontology. Warning: deletions may NOT be undone. Make sure you keep backups on occasion using the Export option in case you make a deletion mistake !!! The Import feature has no file extension limitations; make care to pick and assign the proper types for importation. Via the Import and Export buttons, it is possible to work locally with OSF Ontology while exporting to more capable third-party tools. Then, once use of those tools is complete, Import provides the ability to re-import the updated ontology back into the local collection. Note: you are advised to use the inference option at time of import, even though it takes a bit more time to load, since it will build the forward-chain of inferences useful to your system. The Generate All option recreates the serializations files created from these ontologies, like the .SRZ files used by OSF Web Service and OSF-Drupal; the ironXML schema used by the OSF widgets, etc. To learn more about these structures, see the Internally Generated Schema document. The Generate All option should be invoked any time you have made more than minor changes to your underlying ontologies. Frequently, if you have made changes and you do not see them reflected in your portal tools or interfaces, it is because you have neglected to update these structures. Note: the Generate All option takes quite a bit of time to complete, though it does run in background. It is not unusual for this operation to take 30 min or more. You may work with other aspects of the site, it is just that updates will not be fully reflected until this generation step is complete. There is a confirmation message presented when the update is successful. The Reload All option replaces all ontologies on your local instance with those on the server. So long as you have not done any Saving during your current session, invoking this option is akin to starting over with the same conditions at the start of your session. The first step for having a multilingual OSF for Drupal site, is to setup the multilingual modules of Drupal. Once Drupal is properly configured as a Drupal multilingual site, then you will be able to use the multilingual capabilities of different OSF for Drupal modules. In this section, we will cover all the steps to perform to setup the baseline required to have enable the multilingual support of the OSF for Drupal modules. One of the core set of Drupal Multilingual tutorials has been written by Gábor Hojtsy and is available here. Once you checked the checkbox, save the modules settings. The next step is to enable a new language in the Local settings. Go to the Regional and Language settings, and click the Languages link. Then click the Add langauge link to add a new language that you would like to handle in your OSF for Drupal portal. Important Note: make sure that the language you are adding in Drupal is supported by OSF. You should read the Multilinguality Capabilities of OSF documentation before continuing with this tutorial. Once you click the Save configuration button, your Drupal instance will now be aware of the new language you just configured. Now that you handle a new language in Drupal, the next step will be to update the language packages available for this language. The first thing you have to do is to download the l10n_update Drupal module, and to enable it. Once this module is enabled, you will go to the Configurations, and then click the Translate interface link. Then you will click the Update tab. What this section does is to help you adding and updating the language packages of all the modules you currently have on your Drupal instance, with the languages you selected previously. There you will have to choose update options that best fits you needs, and click the Update translations button. Finally choose the mechanism you want to use to do this detection. The next step is to download and enable the i18n (internationalization) module. This module gives access to a series of multilingual API functions, and a multiple of user interfaces that will help us properly managing the multilinguality capabilities of Drupal. The you have to click the Publishing options vertical tab. Finally you have to enable (with translation) the content type. Once all these steps are done, you will be able to translate all the content types pages on your Drupal instance. However, this is out of the scope of this article. If you want more information about doing this, we strongly suggest you to read Gábor Hojtsy's series of articles covering these questions in details. The OSF SearchAPI does support multilinguality without having to configure anything. What it does is to detect the language currently used by the user that perform a search query and will use that language to send the Search query. The only think that is necessary is to make sure that the OSF Search web service endpoint does support that language. When will come the time to create the search templates for a multilingual Drupal portal, the Drupal themers will have to take care, and make sure they properly manipulate the entities to use the proper language to display in the search resultset. Pages in category "OSF for Drupal User Manual"
This page was last modified on 10 April 2014, at 19:49.